So with this update does the dev team feel that the mass/volume is now balance? Should we be able to turn it on and enjoy the game? I'm trying it out, be warned: some of the CV/BA stuff exceed your personal capacity, if you ever drop one of those (i.e. you try to move on the toolbar of a connected box but the connected box is overstuffed) you'll have to go pick it up with a large empty hover vessel cargo box connected. constructors don't stop building when the output inventory is full either, so it's not a rare occurrence to find out your cargo over filled and dropping items by mistake. and the output is per fabricator not per item, so you can't, say, move blocks to a output chest and ammo to an ammo box. this logistic thing is *very* crude, it needs some pull/push like starmade. for now I'd suggest to have different output and connected inventories if you're doing assembly on your SV/HV, much safer that way. Hi there, this may be a stupid question, perhaps I have missed something. Is there any valid reason you can give me why I must now have all my ships lights on to use night vision goggles ? Really I have to power all those on to use night vision ? in a large cv this is going to help with lag ? Please for the love of common sense make a separate key for the master lights, there is already a button in control panel for it, why not just leave master light switch there and use L for torch and night vision only. A key to toggle all the lights on with your night vision boggles the mind because you would not use lights if your using night vision. I suppose this means that if i put my night vision on before i leave my base, all my base lights will activate too ? and potentially deactivate if I press night vision off when i get home, shutting all my grow lights lol. Please fix this because it is so unrealistic and annoying and potentially FPS reducing and its just badly placed. TK85, Cluascorp and stanley bourdon like this. The L key will only switch SPOTLIGHTS (if available) in a future update. Did not make it into A9.2 i am afraid. vscuorzo, nexus_absolute and Furious Hellfire like this. ravien_ff and iliapugach like this. Better base attacks definitely would bring new life to single player games. There was one time back in A7 or A8 that I was setting up a new base near an ocean on a planet I just discovered and suddenly a PV slowly rose out of the water and proceeded to shoot the crap out of my stuff. While I'm sure that was some sort of path finding bug at work it was an awesome surprise attack. Using terrain for cover like that would be a great AI improvement. Sofianinho, nexus_absolute, ravien_ff and 4 others like this. TK85, Cluascorp and ravien_ff like this. HOWEVER, in practice, money will not increase, but decrease over time. So, there's not an exploit, but the visual representations of the prices is incorrect. The Update: January 19, 2019 (Build 2170) just dropped for me on Steam and cannot play due to CPU crashing. Ryzen 7 1700 and RX 580. Tried reboot and overclocking then Ryzen 7 but still crashes. How can I drop back an update? The game was working fine 12 hours ago and no problem with other games so seems to be this "fix". Can we get the container extension textures as regular textures? They work quite well for internal wall deco in general. TK85, ion_storm and Maverick241 like this. Changed to Experimental and everything works again. Can we PLEASE stop having updates to the main branch of the game until things are fixed. I cannot host a server when there are bogus patches issued that wreck the game. 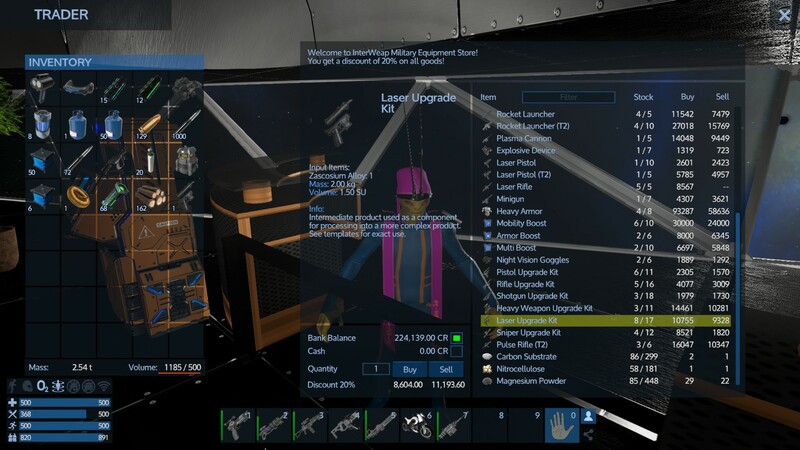 Have the experimental branch be the experimental branch.. develop in there and once items are fixed without breaking other parts of the game and ONLY THEN should they be moved to main. From a MP host perspective, it seems that not enough attention has been paid to client side de-sync issues and more development has gone into adding features/textures/other crap that makes it look nice but does nothing to fix the core playability of the game. This update cycle and chaotic development are turning me off this game and development studio entirely. GoldDragon, TK85, Sofianinho and 2 others like this. I generally simply copy the current instance (game folder) to another location and run from there. It cannot be updated by Steam as it's a different folder, but still runs fine as long as the Steam client is running. This is what I've done in the past, so I can play with a new version while retaining an older version for a game in progress. Does this no longer work? I am currently playing with the Steam version as I want to tinker with the new stuff - I've not got a long-term game in progress going on currently, hence not 100% sure the method above still works. On another note, is late Drone pop-in proving a near game-breaker for anyone else currently? Many times now, I'm being hit long before the Drone is actually rendered. Just moments ago I was approaching a Deposit on a moon, zero Drones. I get closer, zero Drones. I'm then within about 250-300 metres and suddenly I'm taking damage - yet there's no Drone. I move even closer and then there's a muzzle flash being rendered over the Deposit, but....no Drone. Only when I approach a little closer - I'm obviously "testing" at this point, not playing - does the Drone finally render in. Drone pop in is becoming a significant problem in Alpha 9, where it wasn't much of a problem previously - at least for me. Are others seeing this also? Or is it perhaps some weird artefact of me continuing a earlier 9.x save? If this was early-game for me - it's not, I have a basic CV - and this was my first HV, it could very well have been blown apart quite literally by NOTHING, as no Drone was rendered when I started being shot. Not sure whether to class this as a bug or not, I suspect it is, but would love to hear if others experience this on a regular basis. Note: once the Drone is finally rendered, increasing distance does not see it vanish again, so it's only the initial approach to the Drone that seems to be affected by this issue. I don't this this can reliably be re-produced from a save, as you don't know that a Drone should be rendered, until you start getting hit and / or it pops in very late. Then they need to stop having a separate Stable and Experimental branch. Stop being an apologist for their bipolar release schedule. Rushing out 9.0 way before it was ready with no release candidates is sad enough. Comments like this don't help anyone. I think alpha 9 needed a few more weeks in experimental but having a couple rough weeks after a major update is absolutely expected in alpha games, regardless of how long something stays in experimental. There are problems and bugs that simply won't be found until an update goes live to the general player base. What matters is how the devs continue to fix and improve things. All the updates since then have fixed many of the problems people ran into. Calling it bipolar or calling people apologists doesn't help the devs improve the game and it certainly doesn't help your fellow players. Jawatraders, malrose1, Maverick241 and 3 others like this. Don't know how your settings are, but I'm running a Ryzen 5 2600 and an RX 550 and I've had nothing like that. If you're Overclocking your Ryzen 7, then I hope you don't have the Stock Wraith Cooler. You need an AIO Water Cooler for that. The Stock Wraith Cooler can't handle the heat too well for Overclocking the Ryzen CPU.